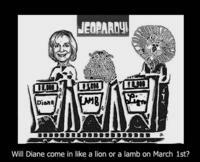 This is (Diane on) Jeopardy! I got an invitation to join my friend Diane in watching her on Jeopardy! tonight! That’s right, Jeopardy! And that’s not just any regular Jeopardy! episode… it’s part of the Ultimate Tournament of Champions! Alex kept commenting on the fact that I look surprised when I responded and I was right, but many times I really was surprised that I had come up with correct answer. In fact with one category which was kind of unusual called ì ëde’ Guysî I somehow came up with Lee De Forrest as an answer. That was a name I didn’t even know I knew. It wasn’t until late that night after going to bed and trying to sleep after all the excitement, just as I was dozing off, I sat straight up in bed and remembered the reason I knew the name De Forrest. I could visually recall the exact place on the wall of the small museum in my hometown of Auburn , New York , where earlier in that year on a summer visit back east, I had read a framed letter from De Forrest to Theodore Case, a local inventor. It was amazing to me that that small and casual encounter could be tucked away just waiting for the moment it needed to be retrieved. It made me marvel at the way the human brain works and what a mysterious thing memory is. Did being on Jeopardy! Have an affect on your life? Definitely. it gave me confidence to set goals and know that if I worked hard I could achieve them. A few years after winning on the show I returned to the work force after having been a full time mom for over fourteen years. I wanted to switch my occupation and I had to secure an entry level job in the new field. I didn’t have any recent paid work experience to note, but when people read I had won on Jeopardy that usually got their attention. I really can’t say that it helped me land a job but I do know it helped me land some interviews and that can be a tough step in the job search process. I felt it was always my ace in the hole. I have been a ìshopperî my whole life and it wasn’t until last year that I made a determined effort to declutter my life ñ so when I was hauling off sacks of shoes, clothes and stuff to charity last year, probably a lot of those ìcrazyî mall and yard sale and thrift store purchases came from Jeopardy winnings. I should have weighed them! I love my current job as an educational consultant and writer. I get to do research on fascinating subjects in art and history and science and develop fun activities for children to introduce them to new ideas and people. I have had the privilege of working with museums and libraries in Los Angeles and with the National Archives and the Jet Propulsion Laboratory. It is exciting to have a career where your work involves learning all the time. I am also very proud of two organizations that I serve on the advisory board of in Los Angeles . WriteGirl pairs teenaged girls who love to write with professional women writers as mentors. That program got me writing poetry again and it is inspiring a whole generation of young women to express themselves through writing. And the Teen International Media Exchange or T.I.M.E. has sent US teens to South Korea and soon to Belize to learn to work cooperatively across cultures to develop student media projects with their exchange country’s teens. Both programs help kids find their voices and show the world what they are thinking. I have a wonderful husband and two great kids who are fine artists and wonderful people. I thank my extended family and my generous friends for cheering me on and just being the exceptional people I am lucky enough to have in my life. Yay for Diane! I missed tonight’s show so I didn’t see her, but I hope she did well. Joz, be so kind and give us an update if you caught the show. I need to get on another game show. I was on the Pyramid a few years ago. It was lots of fun and I won some moolah!